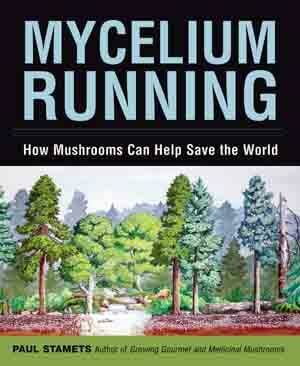 Mycelium Running – How Mushrooms Can Help save The World! by Paul Stamets. How Mushrooms Can Help save The World. The science is simple. In Mycelium Running, Stamets discusses the various branches of this exciting new technology, including mycorestoration (biotransforming stripped land), mycofiltration (creating habitat buffers), myco-remediation (healing chemically harmed environments), and mycoforestry (creating truly sustainable forests). Also featuring instruction in the fine art of mushroom cultivation and tips for choosing the appropriate species of fungi for various purposes. 352 pages. Many color plates, Glossary, Bibliography.